1. Preheat oven for 325 degrees. 2. Mix the eggs, half and half, mustard, 2 tablespoon maple syrup and salt in blender for five seconds and pour into a wide bowl for dipping. 3. Layer four slices of bread with cheese, ham, pear and another layer of cheese, then top with remaining for slices of bread. 4. Cut in half. Dip the sandwich halves into egg mixture and fry on a griddle over medium heat until brown on both sides, about 5 minutes. 5. Move sandwiches to a parchment lined cookie sheet when done. 6. Cover and place cookie sheet in oven for 20 minutes, uncovering after 15 minutes, until completely heated through. 7. Serve the two halves on a plate with fresh raspberries, maple syrup, and a small ramekin of raspberry preserves. You can add diced kiwi for color and a light acidic bite. A Maine breakfast is more than just blueberries. Dana Moos of the Maine Innkeeping Academy shows you how to whip up a delicious and beautiful breakfast, whether you're cooking for your out-of-state in-laws or running your own B&B. Maine is a travel destination, and its B&Bs are some of the most visited places in the state. Dana Moos, the former innkeeper of the Kingsleigh Inn in Southwest Harbor, has great advice on serving a breakfast that not only tastes great but looks good too. Perfect for B&B owners, but also great for folks with out-of-town guests, this book makes creating an artful and tasty breakfast easy. "The Art of Breakfast" is full of luscious photography, taken by Moos herself, of more than 100 kitchen-tested recipes, from sweet to savory. As an innkeeper, Moos cooked breakfast and brunch for large crowds on a daily basis, and discovered what people love, like asparagus, caramelized onions, crab and lobster; and what people don't generally love, like broccoli and mushrooms. As a result, there's a comfort food factor to many of the dishes - but with a gourmet touch, and a distinct visual flair. 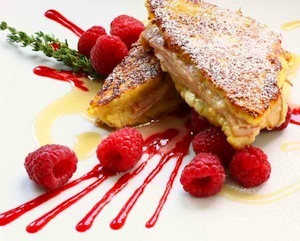 One look at the images that go along with recipes like Chive and Cream Cheese Scrambled Eggs in Wonton Cups, or a Monte Cristo with Ham, Maine Maple Mustard, Pears and Havarti, and your tummy may start growling. Moos pays special attention to Maine ingredients such as maple, blueberry, crab and lobster, but stresses that the majority of the elements of most recipes are common pantry items. There are also detailed instructions on how to plate and garnish the dishes, so the home cook can recreate Moos' almost too-pretty-to-eat presentations. "It lets me be creative," said Moos. "Any excuse I have to make brunch for people, I take. It's my outlet. The plate is my canvas."